Learning from Life: What a great story! --by The Huffington Post, Original Story, Aug 10, 2012 He's a world record holding sprinter from South Africa. She's a spunky 5-year-old from Essex, England. In an inspiring series of images that have recently gone viral, the two strangers, united only by a stubborn refusal to let double amputations stop them, race each other in a friendly bionic foot race. Oscar "Blade Runner" Pistorious, 25, was just 11 months old when doctors discovered he had no fibulas, requiring below-the-knee amputations of both his legs. Ellie May Challis lost both her hands and legs at 16 months, after contracting a severe case of meningitis. 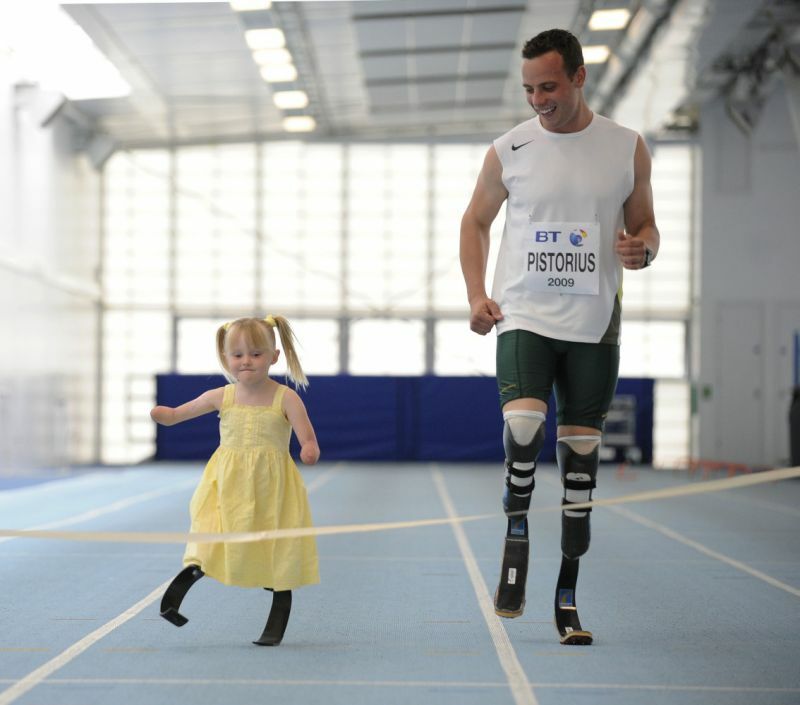 Although Ellie was originally fitted with standard prosthetics, the toddler found them difficult to walk with. More sophisticated carbon fiber legs -- the kind worn by Pistorious -- were expensive, but Ellie's community rallied behind her, raising the $15,000 needed for the replacements. In 2009, the 5-year-old became the youngest person ever to be fitted with carbon fiber prostheses. Held at an indoor track in Enfield, North London, little Ellie actually bested the champion sprinter in all four of their 15-meter races, to the cheers of her twin sister Sophie, and older siblings Taila and Connor. In a historic announcement, Pistorious, who runs using special Cheetah Flex Footlimbs, was granted permission to race in the London 2012 Olympic Games,reversing a ban by the Court of Arbitration for Sport. The International Association of Athletics had ruled Pistorious could not compete in the games because his Flex Foot limbs represented an unfair advantage. However, the Court reviewed evidence from two new (and conflicting) studies before making its ruling in favor of Pistorious. Pistorious qualified for the semifinal heat of the 400 meter race on Sunday, but failed to qualify for the finals. His time, 46.54 seconds, was two seconds slower than the heat's winner, reigning world champion Kirani James of Grenada. In a show of respect and sportsmanship, James embraced Pistorious after the race and asked to exchange bib numbers. "I just see him as another athlete, another competitor," James told reporters the day before the semifinal. "What's more important is I see him as another person. He's someone I admire and respect." For his part, in an interview on the TODAY show, Pistorious said he will cherish his Olympic memories for "the rest of [his] life." As his 89-year-old grandmother watched from the stands, Pistorious said, "Hearing the roar of the crowd and knowing that there were so many people behind me just made it that much more enjoyable.